It’s no secret that beer and wine share a common heritage that dates back to the earliest days of human civilization. Both drinks are produced through the fermentation of grape and grain, respectively – two of the world’s oldest crops – but it’s the winemaker who has more often maintained a more intimate relationship with the agricultural landscape over the centuries. Thanks to industrialization and modern transportation, the various labors required to make beer are often separated by great distances and divided by vocation. While one farmer grows hops, another raises grain destined for the malthouse. And when the work of the maltster is done, the grain is sent along to the brewery, which might be even further removed from the farmland on which it was grown – often in a city. Beer has become famously associated with particular cities in history – Munich, London, Dublin, Pilsen, Milwaukee – in ways that no wine ever has. Winemaking has mostly remained a rustic pursuit of the countryside, to a point where the qualities of a vintage might be attributed to the sunlight and soils of a certain vineyard. There’s even a word for it in French – terroir – an expression of characteristic flavors derived from the land itself. For birders who know the importance of being in just the right habitat in finding a particular species, this isn’t at all an unfamiliar idea. Of course, habitats of all sorts attract wildlife. While the city brewer might contend with urban vermin like rats and pigeons, the country vintner generally enjoys the company of more charismatic wildlife. That isn’t to say that all are welcome: the wine industry expends a great deal of money and effort every year in keeping birds and other hungry pests away from its vines. And as any gardener who’s struggled to protect apples and strawberries from hungry robins and waxwings knows, this can be a largely unfruitful endeavor. 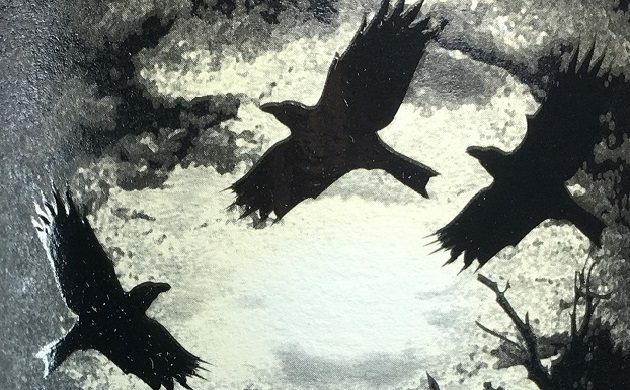 Ravens are among the most cunning and persistent of avian scavengers, and their persistence in pilfering and scrounging from us for their daily sustenance has earned these opportunistic birds a place in creation legends from around the world. Whether they’re making an appearance at the beginning of the world or its cataclysmic end, gnawing on the corpses of our dead, or just nicking a juicy grape from the vine, the sly, dark raven looms large in the mythologies of many cultures – and at least one winery. 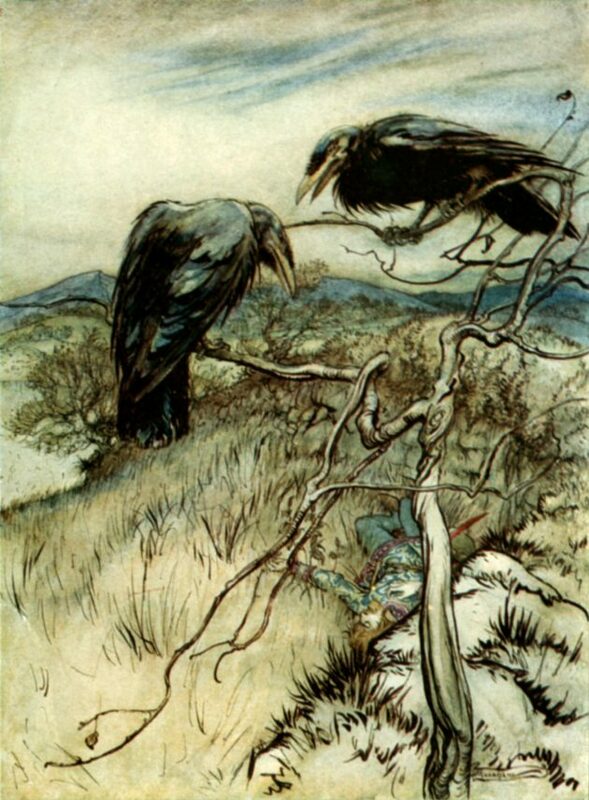 Twa Corbies – or two ravens – pondering their next meal in an illustration by Arthur Rackham. Ravenswood Winery was founded in Sonoma, California in 1976. Its very first grape harvest took place in the fall of that year, with the winery undermanned and under the threat of approaching thunderstorms just as the fruit was nearing its peak. Founder Joel Peterson worked alone to bring in four tons of grapes in a single day before the weather turned, his labors accompanied by the raucous croaking of some nearby Common Ravens. At first, the beleaguered vintner interpreted the calls of this dark and ominous conspiracy as unhelpful taunting. But after the harvest was ultimately spared from the rains, a rainbow appeared and Peterson came to view these birds as guardians over his vineyards. 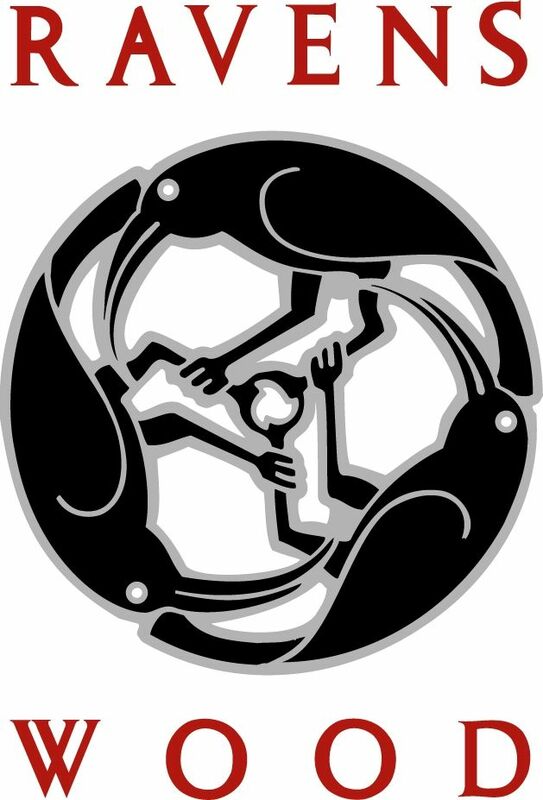 A garland of three ravens – rendered by artist David Lance Goines in a sleekly sophisticated Craftsman-style design – commemorated Peterson’s change of heart and became the iconic logo for the new winery. The Ravenswood Winery logo designed David Lance Goines, who also did design work for the landmark Berkeley restaurant Chez Panisse. Ravenswood claims their logo just might be the most tattooed winery image in the entire business – and anyone who gets inked with their logo is eligible for free tastings for life. Over forty years later, Peterson and Ravenswood Winery are still making wine under the watchful eyes of these benevolent vineyard corbies. 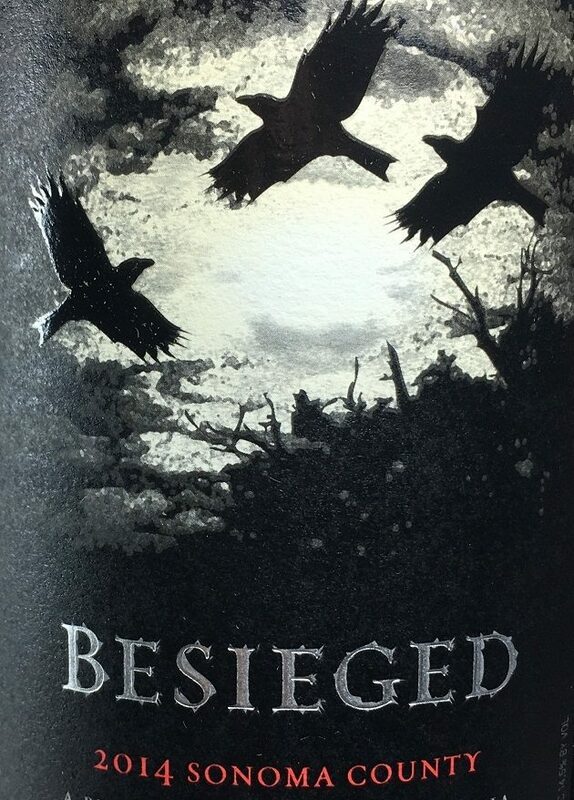 In 2014, the winery released Besieged, a blend of petite Syrah, Carignane, Zinfandel, Syrah, Alicante Bouschet, Barbera, and Mourvedre grapes. 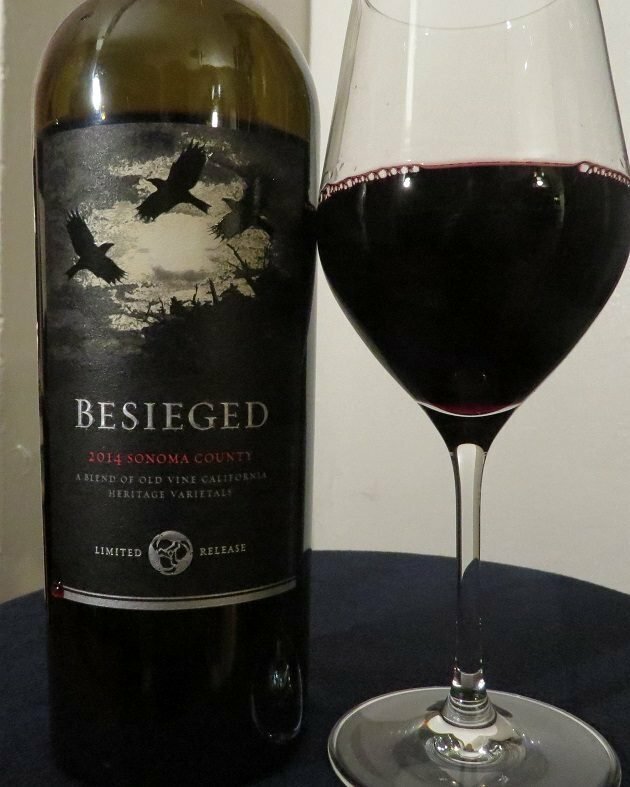 Besieged is a powerful California red, weighing in at a hefty 14.5% alcohol by volume. Black cherry and stewed fruit flavors stand at the forefront, backed by an oaky, boozy punch, with hints of leather and allspice. This full-bodied red finally relents at the end with a long, dry and tannic finish. With the grape harvest in northern California nearing its halfway point, the now four-year-old Besieged makes a fitting celebration of this annual cycle, and its rich, robust flavors should be welcomed by drinkers as an autumnal chill settles over the northern half of the world in the coming weeks. I love Ravenswood wine (even before I lived in Chicago’s Ravenswood neighborhood). This sounds yummy — thanks for the heads up! Thanks, Meredith – this was my first time having their wine but I look forward to more!